A wireless signal jammer is a device which blocks transmission by creating interference. This wireless signal jammer can be categorized into the Radio Frequency (RF) jammer and GSM jammer. A Radio Frequency jammer is a device used to disrupt or prevent communication via a broadcasted RF signal. It is an RF and GSM frequency disrupter commonly known as wideband radio frequency (RF) and GSM cell phone jammer. Simultaneously, they can blocks all commercial FM broadcast band (87.5 MHz to 108 MHz) and GSM signal transmissions within the jammer’s transmission range. The device can possibly block these frequencies by transmitting a dirty signal (like noise) on the same frequency at which the GSM and radio system operates. A Radio Frequency jammer is a device that transmits a radio frequency signal on the same frequency at which the radio system operates and the jamming succeeds when the radio sets in the area where the jammer is located are disabled. A GSM jammer is a device that transmits a signal on the same frequency at which the GSM operates. The jamming succeeds when the mobile phones in the area where the jammer is located are disabled. In recent times, where bombs are being planted and detonated by GSM or Radio Frequency signals, this device can be at an advantage by jamming the signals required for the detonation of the bomb. Presently, the mobile jammer devices are becoming civilian products rather than electronic warfare devices, since with the increasing number of the mobile phone users the need to disable mobile phones in specific places where the ringing of cell phone would be disruptive has increased. These places include worship places, university lecture rooms, libraries, concert halls, meeting rooms, and other places where silence is appreciated. The solution to these annoying and disrupting noises is to install a device which can block the signal transmission from mobile phones and radio sets and thus, disrupt the triggering of bombs by these wireless signals. The technology being used by this device is very simple. The mobile phone transmission is being blocked and interfered by RF which creates high noise. The frequency being generated by the jamming device jams the signal being generated by the cell tower (as illustrated in figure 1.1 below). When the signal has been blocked, the mobile phone will show “NO NETWORK” on the network bar, and radio devices will not be able to tune into any signal. Thus, all phones and radio devices in the 200m radius of the jammer will be having the same situation. The reason I am developing this device is for educational purpose only. This device was developed and tested in this report just for Final Year Project presentation. There is no intention of manufacturing or selling such device in Nigeria or elsewhere. In the construction of this wireless signal jammer, the device will be able to jam GSM and Radio Frequency (RF) signals and this can be done alternatively through a switch. The block diagram in Fig. 1.2 below gives a pictorial representation of the working principle of a wireless signal jammer. From the Fig. 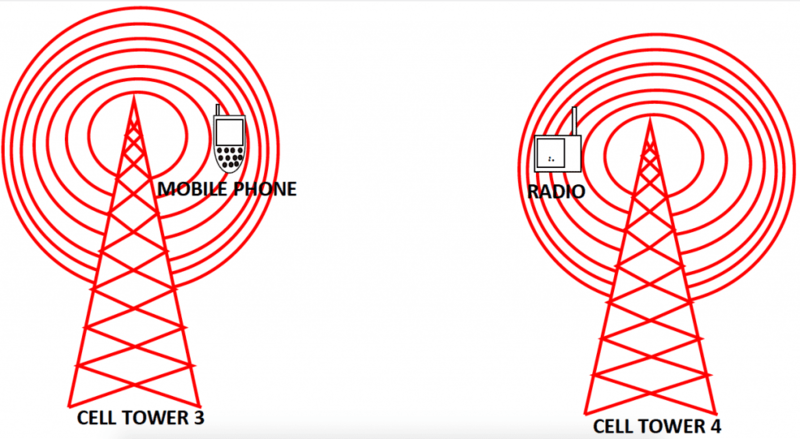 1.2, the jamming device jams cell phones and radio sets within the range of cell towers 1 and 2. The cell tower 1, 2, 3 and 4 transmits signals which can be received by GSM or radio sets. 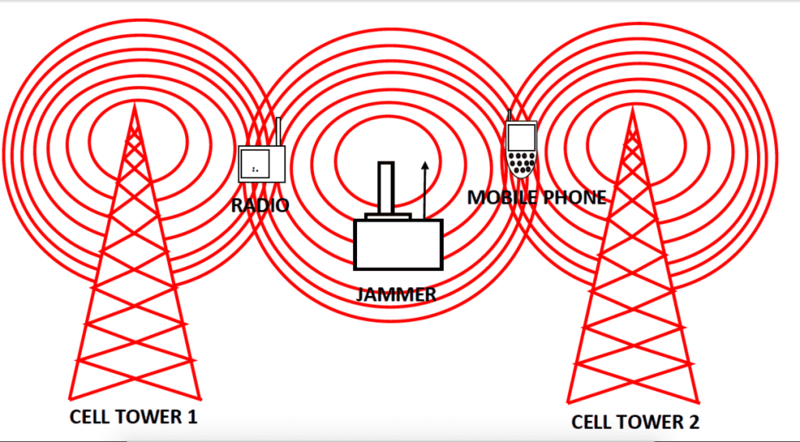 The jamming device is placed in-between cell towers 1 and 2 and thus produces a signal which is at the same frequency being operated /transmitted by the cell tower. It can be said that the resultant of the signals is zero. From Fig. 1.2, the sending object is the jamming device and the target object is the cell towers. However, mobile phones placed within the range of cell towers 3 and 4 will not be jammed due to the fact that they are not within the range of the jamming device. Due to the increasing sophistication and high technology, most people are using mobile phones, and also due to the need for man to stay updated with his environment, the use of radio is also in wide use. Mobile phones have become a very important communication tool today. With the use of the mobile phones everywhere, it becomes annoying device while working, studying, praying and many more. Modern technology has contributed to the sophistication of bombs which are being triggered by GSM and Radio signals. Wireless mobile jammer can be placed in schools, mosque, and conference hall, meeting rooms, library and many more places which need quiet and peaceful environment. This device will block the transmission of Radio and GSM signals. To design Radio Frequency (RF), Intermediate Frequency (IF), and Power Supply circuit. To construct the Development of Wireless Signal Jammer for Security Application’s circuit. To simulate Intermediate Frequency (IF) section circuit. To block mobile phones transmission by creating interference. To block amplitude modulated and frequency modulated signal transmission by creating interference within its range. This project only focuses on blocking the signal transmission of GSM900 which is the range between 935 to 960 MHz. This is because the components are hard to find in Nigeria for the GSM1800 frequency range between 1805 to 1880 MHz The components for GSM1800 are also very expensive compared to GSM900. The second limitations of the project are, the device only can block the three main operators which are ETISALAT, MTN and GLOBACOM. This is because, the lines are only for Nigerian users and the frequency band range is between 935 to 960 MHz. These requirements fulfil the GSM 900 specifications. 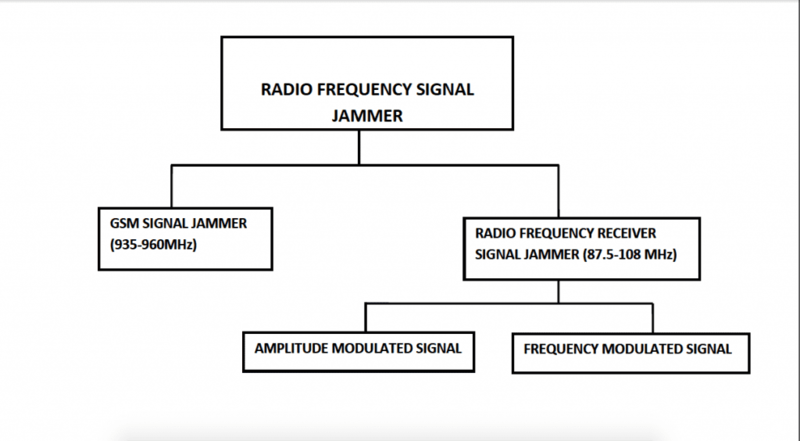 The third limitation is that for reliability of the jammer, a Radio Frequency amplifier should be incorporated but the components required for this are difficult to find in Nigeria. Ahlin, L. (2012). Principles of Wireless Communications, (4th Ed.). Spain: McGraw-Hill Education. Amos, S. W. (2003). Principles of Transistor Circuit: Introduction to the Design of Amplifiers, Receivers and Digital Circuits, (9th Ed.). England: Hartnolls Ltd.
Anderson, C. E. (August 2003). The performance of a Wireless LAN Access Node Using Antenna Beam Forming for Dynamic and Static Users. New Jersey: Radio and Wireless Conference. Andren, C. B. (January 2000). Intersil prism II radio Jamming margin test. New Jersey: Radio and Wireless Conference. Datasheet Search System. [Internet] (©2003-2006). Retrieved on 2013-07-27. From: http://www.alldatasheet.com/. Forrest, M. V. (2000). Engineer’s Mini Notebook, Timer, Op Amp & Optoelectronic Circuits & Projects, (1st Ed.). New Jersey: Master Publishing. Gligor, V. D. (2007). A Note on the Denial-Of-Service Problem, (3rd Ed.). U.S.A.: Houghton Mifflin Company. Horowitz, P. Etal (2005). The Art of Electronics, (4th Ed.). U.S.A.: Cambridge University Press. How Stuff Works [Internet] (©1998-2006). Retrieved on 2013-07-27. From: http://www.howstuffworks.com/. Nigerian Communication Commission. [Internet] © (2005-2013). Retrieved on 2013-06-02. From: http://www.ncc.org.ng/. Theraja, B. L. et al (1994). A textbook of electrical technology, (21st Ed.). Ram Nager, India: Publication a division of Nirja Construction and Development Co., Ltd.